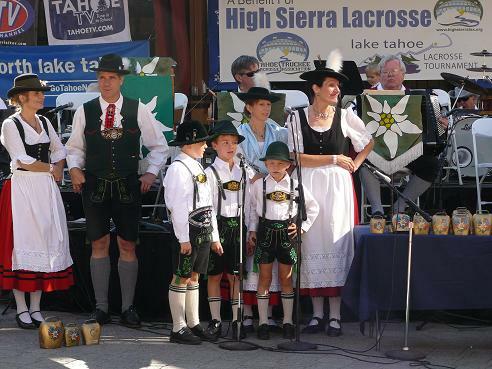 The High Sierra Lacrosse Foundation formed a partnership with the Squaw Valley Neighborhood Committee (SVNC) in 2007 and has provided volunteers for the event every year since then to help staff the Oktoberfest Celebration. A portion of the proceeds from the event are donated to the Foundation and serve as a major source of funding for youth lacrosse programs in the Tahoe Basin and Northern Nevada. This event might be the most exciting fundraiser around. Oktoberfest! Traditional Bavarian music and folk dancers, benefit beer garten, brats, kraut, pretzels & “Oktobergames” from about 12 to 6 pm. Oh yeah, there’s yodeling too! The event is pet friendly (bring your dogs) and family-oriented (dancing for the kids). All of the Village shops are open too, so you can spend the whole day! For future planning, the event is held during the traditional time of Oktoberfest on the last Saturday of September or the first Saturday of October. 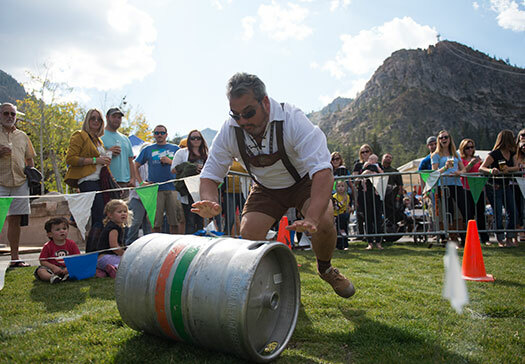 The Oktoberfest event takes place in the Olympic Village at the Squaw Valley Resort in Olympic Valley, California. Parking is free and access is quick and easy. Your participation benefits local student-athletes. Since 2007, the Foundation and their volunteers have poured thousands of gallons of cold beer, sold copious amounts of delicious pretzels, served tasty root beer floats, mc’d keg rolling and bratwurst tossing competitions, and served various other roles all to raise funds for youth lacrosse. On top of the actual labor, Foundation and SVNC members have spent countless hours coordinating and organizing volunteers to operate as a well-oiled Oktoberfest-celebrating machine. We are very thankful for the opportunities presented to us by the SVNC as all of these efforts translate into gifts, grants, and loans that are given back to the lacrosse community. Please consider volunteering a few hours of your time at this great event. Email us at . For more information about the event please visit Squaw Valley’s website.